The Oklahoma eviction notice forms are required to alert a tenant who is in breach of a lease, that he or she is on notice of a potential eviction action (also known as a Forcible Entry and Detainer Action). There are different time periods required for tenant to respond, depending on the breach. Once the requisite time period has expired and tenant has failed to respond appropriately to the notice, a landlord can file a forcible entry and detainer action with the local court. You will have to file this action in your local small claims court in most cases. View a FED Petition and a Summons. You will have to obtain a summons and have the summons and complaint served on tenant. If you prevail, the court will issue a Writ of Execution which requires the tenant to vacate immediately. Immediate Notice to Quit – In accordance with § 41-132, this notice is used in the event the tenant is causing immediate danger and harm to others and/or the premises. 5-Day Notice to Quit (Non-Payment of Rent) – This form is for use when the tenant has failed to pay rent when it is due. The tenant will have five (5) days to respond before the landlord can file an eviction action in court. 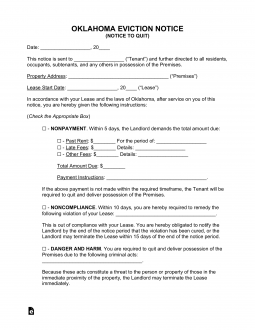 10/15-Day Notice to Quit (Non-Compliance) – This form is for use when a tenant has failed to abide by the terms of the lease. The tenant will have ten (10) days to fix the issue or will face eviction at the end of the fifteen (15) day period. 30-Day Notice to Quit (Month to Month Tenancy) – This notice form is to inform a party of the impending end of a month-to-month tenancy and that they will have to vacate at the end of the 30 day period. If they do not vacate in time, they may be subject to an eviction process. In Oklahoma, rent is due on the date set forth in the lease. If the rent is not received by the landlord by that date, the landlord may serve notice of non-payment and the tenant will have five (5) days in which to pay before further action is taken. Step 3 – You will then have to have the Complaint and Summons served on tenant. You can hire a local process server to perform this service. You will then need a record of the service, as well as copies of the initial notice you sent to file with the court. Step 4 – If the tenant does not respond to the Summons or the judge finds in your favor, you will be able to ask the court for a Writ of Execution (§ 12-1148.10) which will authorize the sheriff to remove the tenant from the premises. The Oklahoma Notice To Quit form is easily accessible as a PDF, ODT, or Word download using one of the document image buttons on the right. When filling out this form, you will need a copy of the Lease as some information will need be recorded on the Notice exactly as it was reported in the Lease. The first fact to be reported is the Full Name of the expected Recipient. That is, who this Notice is being issued to. Enter this information on the first blank line on this page. The second fact to be reported will be the Location of the Leased Property as it is reported in the Lease Agreement. Locate the Address, then using this information, enter the City, County and Zip Code where the Property is found using the first three blank spaces in the statement introduced by the phrase “The premises herein referred…”. Then, report both the Building Number and Street where the Leased Property is located on the fourth blank space. The last blank space in the statement has been provided in the event the Leased Property has an Apartment or Unit Number. The next fact to be reported will be in the form of a Notice. The statement composing the Notice will need to be selected by marking one of the check boxes from the following choices. If a Nonpayment Notice, mark the first check box then (in this order) enter the Authorized Agent Name of the individual who may accept a past due payment, the written out Total Dollar Amount owed by the Tenant, the Total Dollar Amount owed by the Tenant reported numerically, the Overdue Dollar Amount that must be paid to satisfy this Notice written out, the Overdue Dollar Amount that must be paid to satisfy this notice entered numerically, the Month the overdue period began, the year the overdue period began, the month the overdue period ends the year the overdue period ends. This Notice Statement will give the Recipient Five Days to Pay for the Overdue Period by submitting the Overdue Dollar Amount that must be paid or leave the Rented Property to the Owner/Landlord. If a Noncompliance Notice, mark the first check box then report the Lease Violation the Tenant committed on the blank line. If an Immediate Danger or Harm Notice, then mark the third check box and enter the nature of the Danger or Harm the Recipient represents to the Property or its Residents on the blank space. This Notice Statement informs the Recipient they are to return the Leased Property immediately. If a Month To Month Tenancy Notice from the Landlord, mark the fourth box. This requires the desired Date of Termination for the Monthly Lease the Tenant has to be reported as a Calendar Day, Month, and Year on the blank spaces. This Notification Statement will inform the Tenant their Tenancy will end on the Date you specified. This Date must allow for at least Thirty Days’ Notice (starting with receipt of this Notice by the Tenant) to be given. If a Month To Month Tenancy Notice from the Tenant, mark the fifth box. Enter the Calendar Day, Month, and Year of the Termination Date. This Notification Statement will inform the Landlord the Tenant expects to return the Rental Property and leave the premises permanently thus, ending the currently held Month to Month Lease. The Landlord must receive this Notification Statement at least Thirty Days before the Date entered. The Landlord/Agent Declaring this Notice to the Recipient must Sign his or her Name on the blank line underneath the Disclosure Paragraph (labeled “Landlord/Agent Signature”). The final fact to be presented on this document will be “Certificate of Delivery.” It must be verified this Notice was indeed delivered. The Date and Recipient of this Notice will need to be filled into the Certification Statement by the person effecting Delivery and only when Delivery has occurred. Additionally, one of the three statement describing how this document was delivered must be marked by the Agent. The Delivery Methods described will be delivering directly to the Addressee, delivering to a reliable party such as an of age family member who has agreed to give it to the Addressee, and delivering via USPS First Class Mail.